The Delta Delta Chapter of Sigma Chi A Heritage of Achievement Significant Sigs Major General Fredric U.S.A.F., Ret. 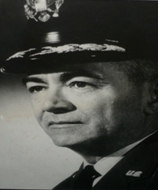 Major General Fredric U.S.A.F., Ret. For a brilliant thirty-four year career that included engineering, budgetary, and security operations for the United States Air Force. For valor and service witch merited the Legion of Merit with three Oak Leaf Clusters, the Distinguished Flying Cross, the Air Medal with Oak Leaf Clusters, and the Croix de Suerre with Palm. And for a promising civilian as a Deputy Director of Administration and Chief of Resources Management for the National Aeronautics and Space Administration.